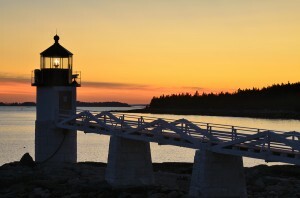 With sixty-eight lighthouses in total, Maine has the most lighthouses that are on ocean waters in the US. 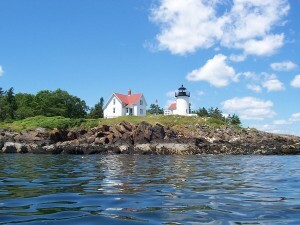 The greatest concentrations of lighthouses in Maine are located in the middle coast of the state which includes all of those in Penobscot Bay southward to Boothbay Harbor. by municipalities or non-profit groups with the Coast Guard only responsible for the maintenance of the lights themselves. Many of the state’s lighthouses are on ledges of rock in the middle of the bay and are only to be viewed by boat or by air. There is also a group of lighthouses within Midcoast Maine that are privately owned you can only view them from a distance. 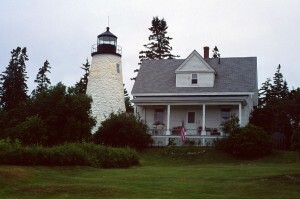 Many of the more accessible lighthouses in Midcoast Maine are open to the public on limited schedules or for the Midcoast Lighthouse Challenge (June 28-29, 2014) or Maine Lighthouse Day in held late in September each year. If you are visiting the area other than during these special events this is how you can get your Lighthouse thrill. 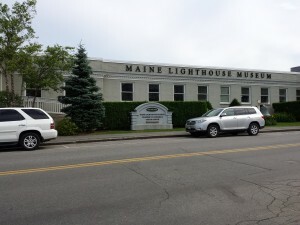 A great starting place is a visit is to the Maine Lighthouse Museum at One Park Drive in Rockland. It is an unbelievable museum that has the largest collection of lighthouse lenses and artifacts in the world. There are working exhibits to explore and a complete collection of Fresnel lights to see up close and personal. The volunteers are extremely knowledgeable and passionate about lighthouses also. The museum is generally open Thursdays – Saturdays March 1st through May 31st and seven days from June 1 – October 31st. Check out the website for hours November 1st through February 1st as they close for winter break during that time. 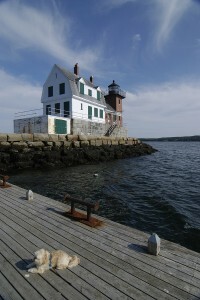 Rockland’s Breakwater Lighthouse sits at the end of a 7/8 mile granite walk. burned in the area and served as a critical source of raw material to build our nation’s cities. In the late 1800s, Rockland Harbor was the 4th busiest harbor on the east coast because of the lime industry. There were over 125 lime kilns with over 65 located in Rockland. The Breakwater was commissioned to be built to protect these kilns from storm surges. The Breakwater itself is about 7/8ths of a mile long and has a 25 foot lighthouse tower and 1902 structure at the end point. Today the structure is managed by the Friends of Rockland Harbor Lights. Visitors can walk the granite pier year round but should avoid being on the breakwater for about an hour on either side of the high tide. 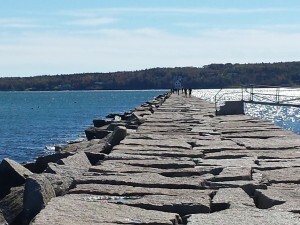 In the past few years there is a 12 to 45 foot section of the Breakwater that will go under water with every high tide. The Friends open the inside of the house and tower to tours weekends and special event days Memorial Day through Columbus Day (weather permitting). There is also a great Breakwater web cam (best to open with Chrome) you can watch the action of both people and the waves crashing at high tide. Owls Head Lighthouse is only 30 feet tall but stands tall about 100 ft above the water. Owls Head Lighthouse sits at the southern entrance to Rockland Harbor. Built in 1825, the tower itself is only about 30 feet high but is sits atop a rocky headland about 100 feet up. The lighthouse is supposedly haunted by both a lightkeeper and his dog Spot. The Friends of Rockland Harbor Lights maintain the structure and open it to tours weekends 10-4 and Wednesdays 1-4 (weather permitting) Memorial Day through Columbus Day. At the base of the lighthouse in the old Coast Guard house is the American Lighthouse Foundation’s InterpretiveCenter and Gift Shop which is generally open Wednesday through Saturdays 10-4 in season. Marshall Point Lighthouse in Port Clyde, Maine. connects to land with an elevated footbridge. It is located in the quaint fishing village of Port Clyde. This lighthouse was featured in the movie “Forrest Gump” when Forrest was running back and forth across the country. Although the lighthouse itself may be visited year round, the tower is only open for special events like Midcoast Maine’s Lighthouse Challenge and Maine Open Lighthouse Day. The former keepers’ house is now the Marshall Point Lighthouse Museum and gift shop. The museum displays artifacts from Marshall Point and other nearby lighthouses including Whitehead, Tenants Harbor and St. George Lighthouses. It is open from Memorial Day through Columbus Day. Since 1998, Curtis Island Light has been a public park accessible by kayak or boat that is owned by the town of Camden. Curtis Island Light guards the entrance to Camden Harbor. The island sits at the entrance to picturesque Camden Harbor. Views of the lighthouse are possible from Bay View Street near Latte Park or from a distance at the top of Mount Battie in Camden Hills State park. The lighthouse itself is not open to the public and is a 25 foot tiny brick light tower that remains an active US Coast Guard navigational aid. The original Fresnel lens remains but the green light has been converted to solar power. This lighthouse was taken out of service in 1934 and is now privately owned. It is located on the east side of Rockport Harbor. The best viewing for this sweet little compound is by boat. If that is not possible from land you can view this lighthouse from Rockport Marine Park. The light was originally built in 1850 and stands 37 feet tall. The light and keeper house are listed on the National Registry of Historic Places. 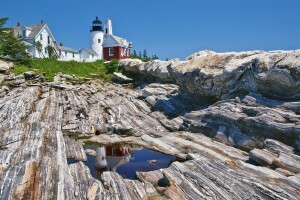 Pemaquid Point Light is one of the state’s most photographed lighthouses. It was built in 1827 and sits 80 feet above sea level with glacier striated rock cropping surrounding it. The actual keepers’ house has been converted into a wonderful Fisherman’s Museum where you can view antique fishing gear and read the logs of old ships. The tower and museum are open daily from 1-5pm from Memorial Day through Columbus Day. There is a fee to park in the lot. Located on Islesboro, an island 3 miles off the shore of Lincolnville Beach, Grindle Point Light was originally built in 1874, decommissioned in 1934 and reactivated in 1987. The structure stands adjacent to the ferry that services the island year round. This is one of the lighthouses that is opened to public for the Midcoast Lighthouse Challenge in June and Maine’s Open Lighthouse Day in September. The keepers’ house is now houses the Sailor’s Museum which is open daily July and August only. Fort Point Lighthouse in Stockton Springs. Fort Point Light was established in 1836 on the west side near the mouth of the Penobscot River. It served as a navigational aid for hundreds of lumber ships a day to Bangor, one of the world’s busiest lumber port. This 31 foot tower stands about 88 feet above sea level. The keepers’ house is currently used as an active Coast Guard station but the grounds with sweeping views of the Penobscot River are open to the public. The lighthouse is located in Stockton Springs and the tower is open to the public during the Midcoast Lighthouse Challenge and Maine’s Open Lighthouse day. 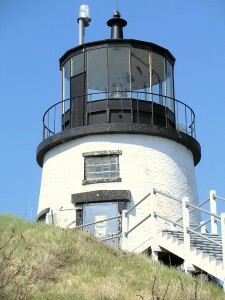 Dyce Head Light is one of the lighthouses open for the Midcoast Lighthouse Challenge. is located in the quaint fishing village of Castine Maine now home to Maine Maritime Academy and one of the most historic small towns in the US. Dyce Head was originally built to aid in the shipbuilding and lumber traffic on the Penobscot River in 1828, discontinued in 1956 and replaced with a metal tower closer to shore. When this metal tower was damaged in 2007, the Coast Guard placed a new optic light in the tower and after over 50 years of being in the dark the lighthouse is now shining again for nearby boats. Although the light and the keepers’ house are owned by the town of Castine the keepers’ house is rented and is private property. The grounds are open to the public daily until dusk. The tower is normally closed to the public but does open for the Midcoast Lighthouse Challenge and Maine’s Open Lighthouse Day in September. 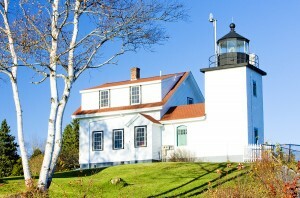 We have self-guided lighthouse maps for the area’s local lighthouses that surround our Rockland, Maine bed and breakfast. Most of the area lighthouses are also open to the public for the Midcoast Lighthouse Challenge in June and Maine Lighthouse Day in September. Additionally, there are Lighthouse cruises and Lighthouse tours by air available in the area for lighthouse aficionados that want to see the many lighthouses not visible by land in the area. If you are extremely enamored with lighthouses and want to be a “keeper” for a night, check out staying at Goose Rocks Lighthouse off of North Haven. Goose Rocks Lighthouse is a 51 foot “spark plug” lighthouse that sits in the Fox Island thoroughfare. It has three stories, 3 bedrooms, eco-friendly bathroom, fully equipped kitchen and living area. You can make a “donation” and you and up to five of your friends can be the light keepers for a night. Sounds like a once of a kind opportunity for the lighthouse lover in your life that already has everything!!! 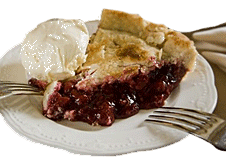 This entry was posted on Thursday, April 17th, 2014 at 10:30 am	and is filed under Festivals & Events, Maine Activities, Rockland Attractions.